On Thursday, Cutter Loose is underway from Town Creek Marina in Beaufort, NC at 9 AM for the 45-NM run to Mile Hammock Bay at mile marker 244 on the ICW. 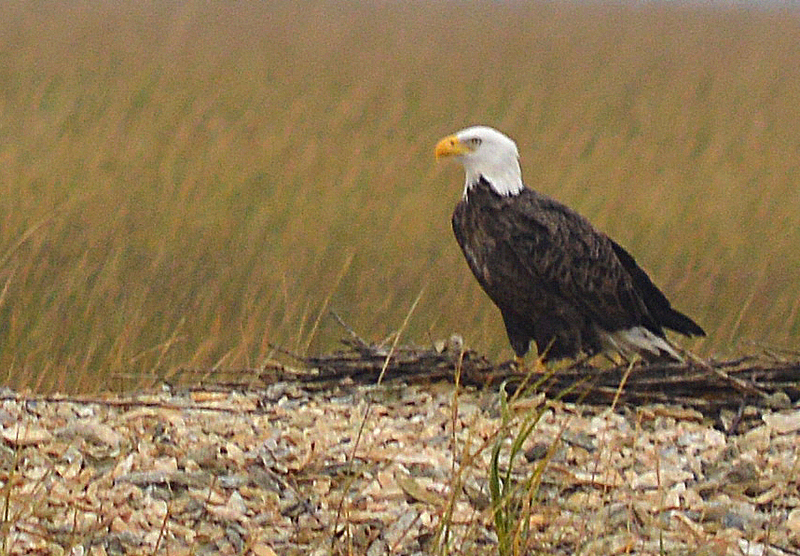 From the marina, we retrace our steps north through Gallant’s Channel, then south in the Chimney Island Channel. Once under the Morehead City “highrise” Bridge, the ICW enters a dredged channel through Bogue Sound, a shallow body of water that separates Bogue Banks (a barrier island) and the mainland. Although well marked with aids to navigation, the dredged channel is quite narrow. This morning, an approaching shrimper travelling in the opposite direction with its arms extended is dragging the centerline of the ICW, sending pleasure boats scrambling towards the extreme edges of the channel to avoid collision. Bogue Sound continues south for 25 miles to Bogue Inlet, where dolphins swim alongside our bow and entertain us with their playful antics. South of the inlet is the tiny town of Swansboro. Beyond Swansboro, a ten-mile stretch of the ICW bisects Marine Corps Base Camp Lejeune which is home to 50,000 marines and an additional 100,000 family members. At 3 PM, the Onslow Beach Bridge opens on schedule to allow Cutter Loose and other southbound sailors to continue their trek along the ICW. At 3:30 PM, the anchor is set in nearby Mile Hammock Bay, a man-made harbor that was used during WWII as a training facility for amphibious landings. 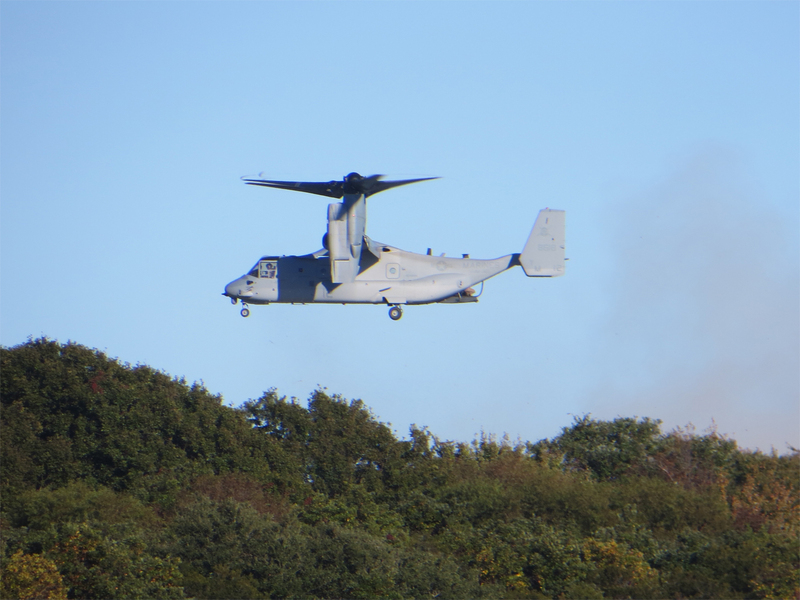 Tonight, noisy helicopter-landing and takeoff maneuvers continue past bedtime. On Friday, the anchor is up in Mile Hammock Bay before sunrise at 7 AM. The purpose of our early start this morning is to arrive at the Surf City swing bridge in time for its 9 AM opening. Battling an adverse tidal current, Cutter Loose arrives at the bridge a few minutes late. Thankfully, the bridge operator agrees to delay the 9 AM opening by a few minutes in order to facilitate our passage. This act of kindness enables us to arrive on time for the 11 AM opening of the Figure Eight Island Bridge, which in turn makes it possible for us to make the noon opening of the Wrightsville Beach Bridge. These three bridges are amongst the most difficult timing challenges on the entire ICW. This morning, we rejoice in scoring a perfect trifecta of bridge openings. From Wrightsville Beach, our course takes us through Masonboro Sound, skirting Atlantic Beach to Snow’s Cut, a dredged canal that provides access to the Cape Fear River. 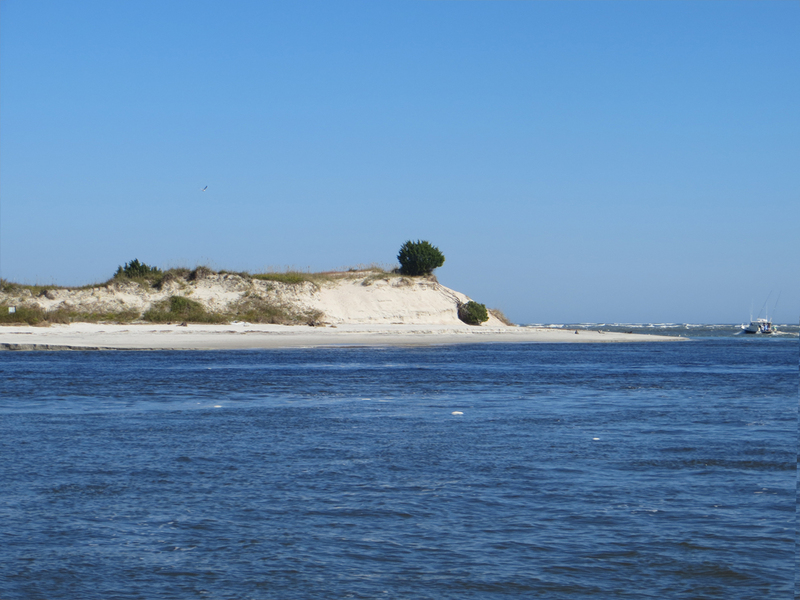 The 2-knot-favorable current in Snow’s Cut raises an expectation that Cutter Loose will enjoy a current boost all the way to the town of Southport, where the Cape Fear River flows into the Atlantic Ocean. Optimism turns into disappointment when an adverse, 3-knot-flood current significantly slows our southerly progress towards Southport. Notwithstanding the delay, the anchor is down in Dutchman’s Creek at 4:30 PM with 64 nautical miles under the keel for the day. Dutchman’s Creek is a tidal tributary and as such, Cutter Loose is riding to current. 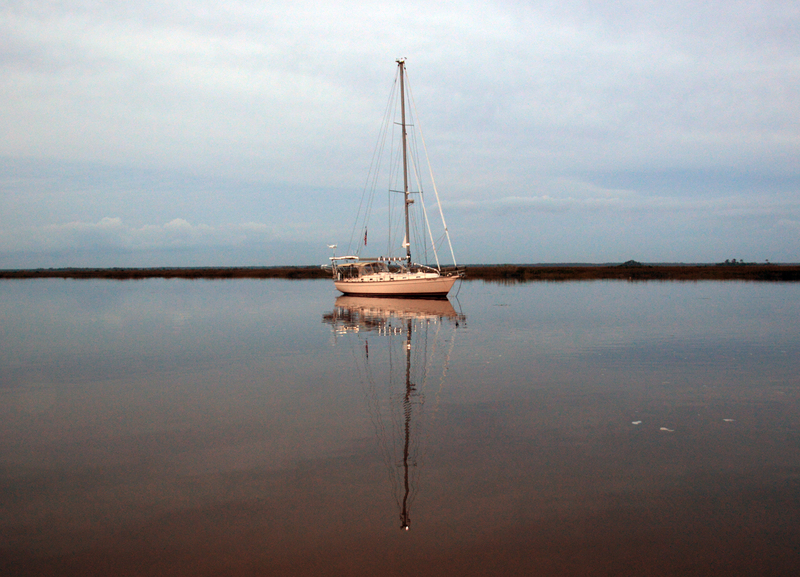 Low tide tonight occurs around bedtime, with less than a foot of water under the keel. At mid tide falling on Saturday morning, there is sufficient water depth in Dutchman’s Creek to facilitate our departure just before sunrise. The snowbird migration is especially dense this morning, with a dozen or more boats concentrated within one mile of waterway. After several hours of jockeying for position, the faster boats gradually pass the slower boats, making their way to the front of the procession. Our course this morning takes us past the communities of Holden Beach, Ocean Isle and Sunset Beach before crossing the North Carolina/South Carolina border near the Little River inlet. 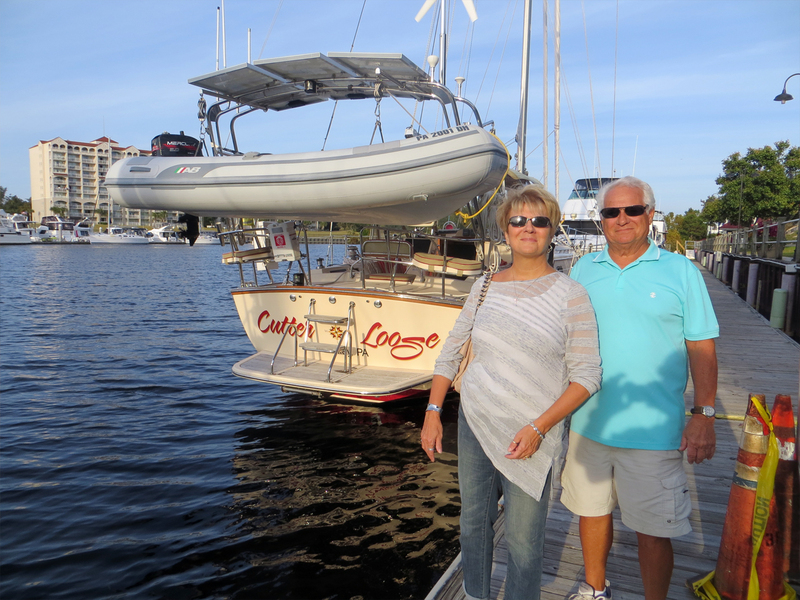 By 1:30 PM, Cutter Loose is docked at Barefoot Landing Marina alongside its integral shopping complex in North Myrtle Beach with 47 nautical miles under her keel for the day. On short notice, my high school classmate Bernie and her husband Rick agree to pay a late-afternoon visit aboard Cutter Loose. Bernie provides updates on children, grandchildren and travel adventures while Rick describes the abundance of golf courses in the Myrtle Beach area. Although brief, our visit with Bernie and Rick is most enjoyable. 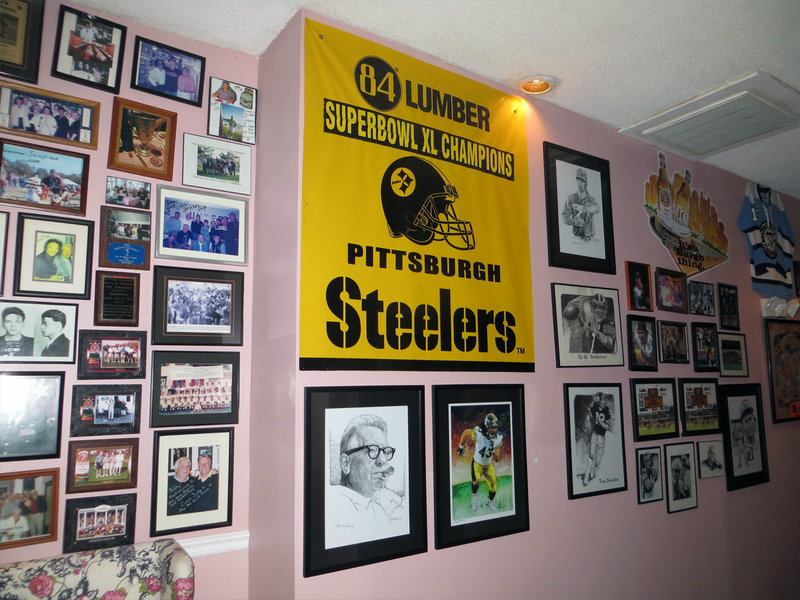 Following our time together with Bernie and Rick, we enjoy a hearty Pittsburgh Italian meal at Umberto’s with cruising friends Sharon and Greg of s/v Dream Catcher. The clientele at Umberto’s tonight is dominated by large groups of hungry men in golf attire consuming Neanderthal-size cuts of beef and pork. They have timed their junkets perfectly, as the weather has been delightful for golf and other outdoor activities. 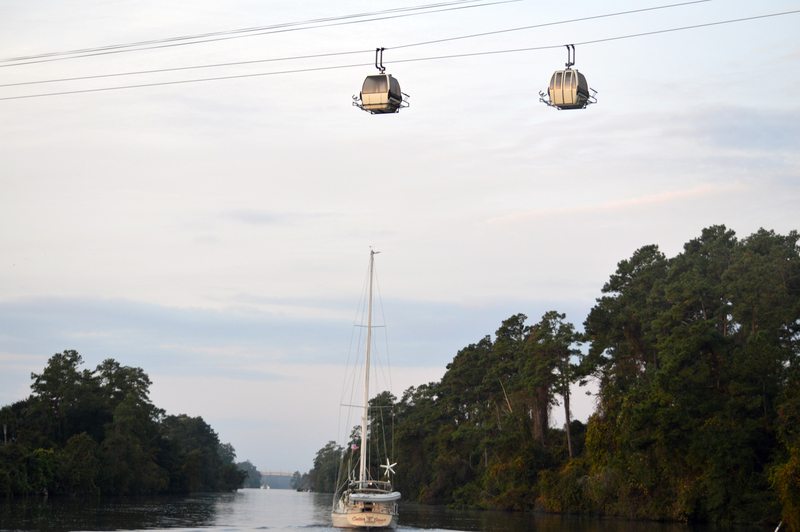 On Sunday, our 0715 departure from Barefoot Landing Marina is designed to coincide with high-slack tide. For the next seven hours, we will enjoy a favorable current all the way to the Winyah Bay inlet in the vicinity of Georgetown, SC. The initial ten miles of our journey today is dotted with Myrtle Beach golf courses, upscale homes, condos and marinas that front on the waterway. Golfers arriving at Waterway Hills Golf Course are transported from the parking lot to the clubhouse via gondola. 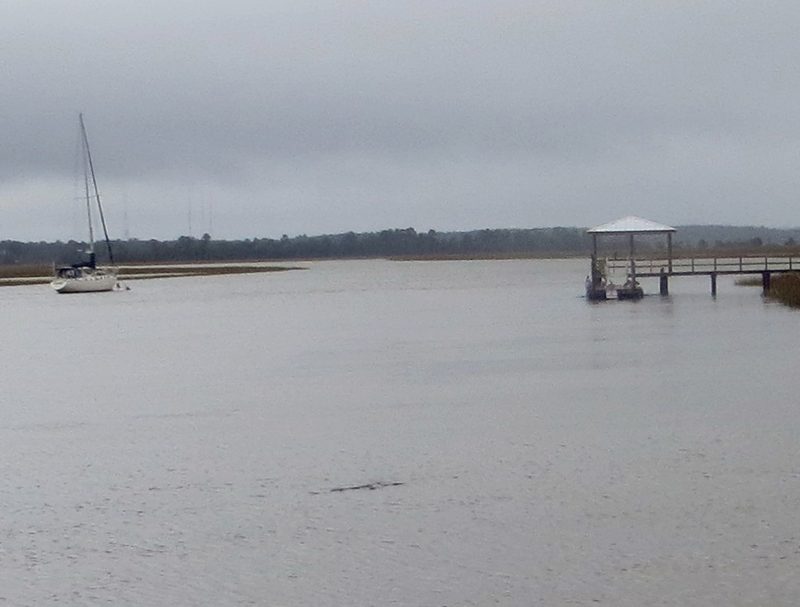 After clearing the Socastee Bridge opening at 0915, Cutter Loose enters the Waccamaw River. 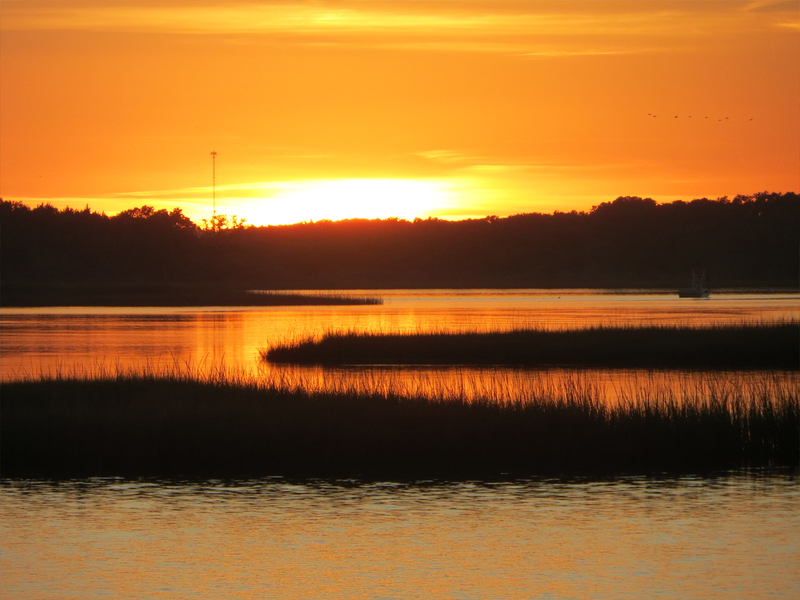 In many ways, this 25-mile, pristine section of the waterway is the signature feature of the ICW. The Waccamaw meanders its way towards Georgetown, its banks lined with live oaks, Spanish Moss and abandoned rice fields. In the stillness of morning, a chorus of birds adds a delightful sound track to this visual experience. The Waccamaw is a perpetual delight. 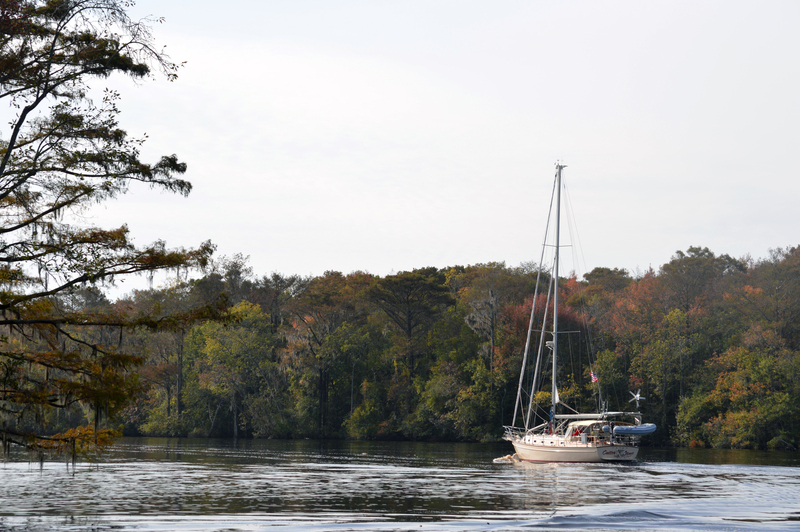 All too soon, it is 1 PM as we leave the Waccamaw River astern and sail under the Lafayette Bridge into Winyah Bay. Instead of pausing overnight at Georgetown, the decision is reached to push on through the Estherville Minim Creek Canal and the Fourmile Creek Canal to the South Santee River where the anchor is down at 3:30 PM. Having completed 60 nautical miles on today’s journey, our trip to Charleston tomorrow will be made shorter. 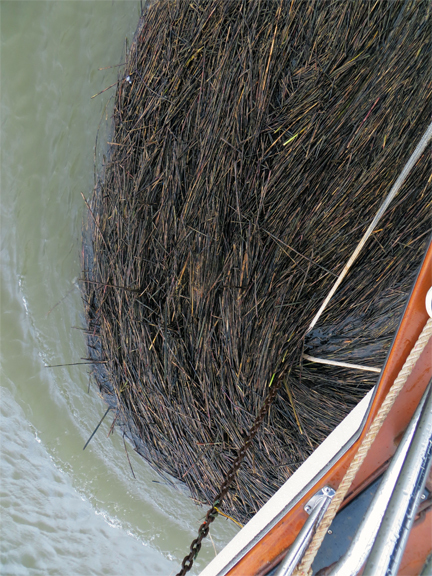 At this point of our winter cruise, we are fully immersed in the rhythm of the waterway. Early morning departures, mid-afternoon anchorages, sunny skies and comfortable temperatures in the 70s add to the enjoyment of travelling south on the ICW in October. We have been making steady progress in our search for the endless summer. However, a frontal system is expected to interrupt this blissful travel experience with rain and windy conditions on Tuesday. Our objective on Monday is to make Charleston in advance of the nasty weather. At 0715, the anchor is up in the South Santee River for the 45-nautical mile run to the Holy City. Our departure coincides with a rising tide. 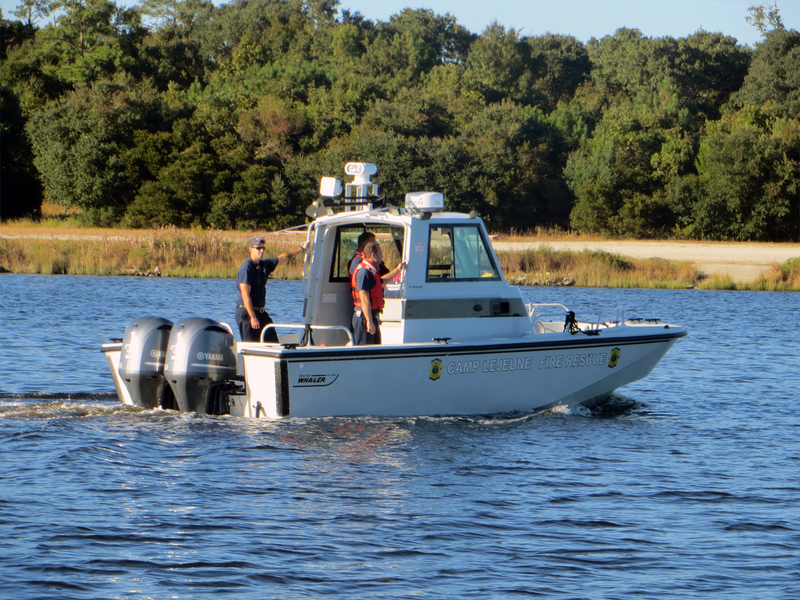 Water depth is important today because the next 20-mile section of the waterway, approaching Isle of Palms, is notoriously shallow and best accomplished at mid-tide or higher. By 11 AM, the wind is blowing at 20+ knots out of the north under mostly cloudy skies. Thankfully, there are no groundings or near-groundings this morning and our arrival in Charleston by early afternoon is imminent. At noon, Cutter Loose arrives at the Isle of Palms on Sullivan Island…the northern doorstep of Charleston Harbor. 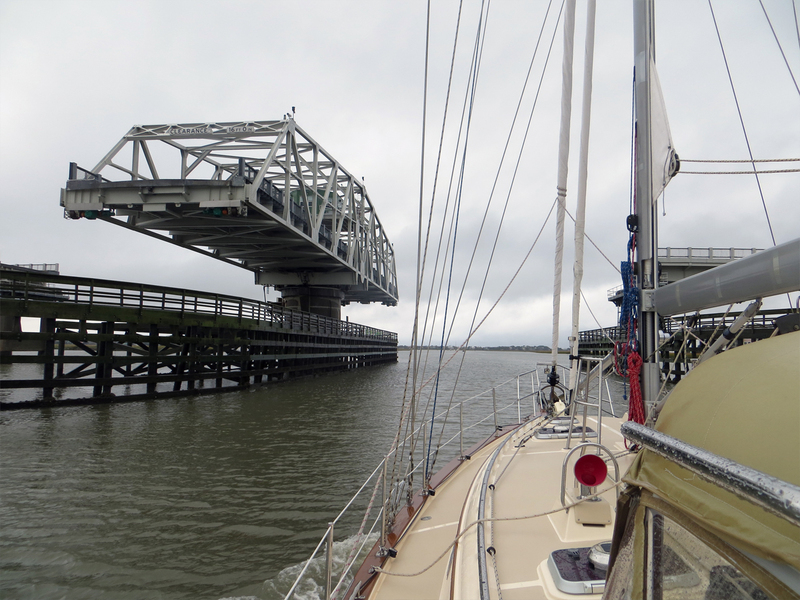 Once through the Ben Sawyer Swing Bridge, our slip at the Charleston Maritime Center is only 20 minutes away. To our surprise and dismay, the bridge operator refuses to open the bridge due to high winds in excess of 25 MPH. At first, we are confident that the closure is a temporary setback. Surely the bridge will open soon. However, after further conversation with the bridge operator, we come to understand that there has not been a single opening all day. 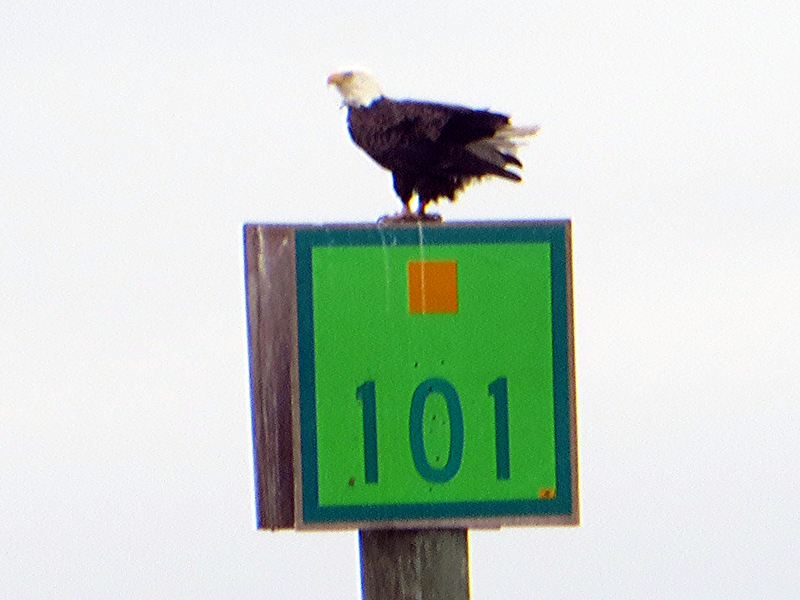 Rather than circling in front of the bridge for hours, the decision is reached to anchor temporarily in nearby Inlet Creek until the wind subsides. Cutter Loose is lying in the lee of a tree-lined bank of the creek which provides some protection from the brisk northeast winds. By 5 PM, it becomes apparent that there will not be an opening of the Ben Sawyer Bridge today. Armed with this realization, we prepare to settle in for the night. Arriving sailboats have been accumulating in this shallow creek all afternoon. 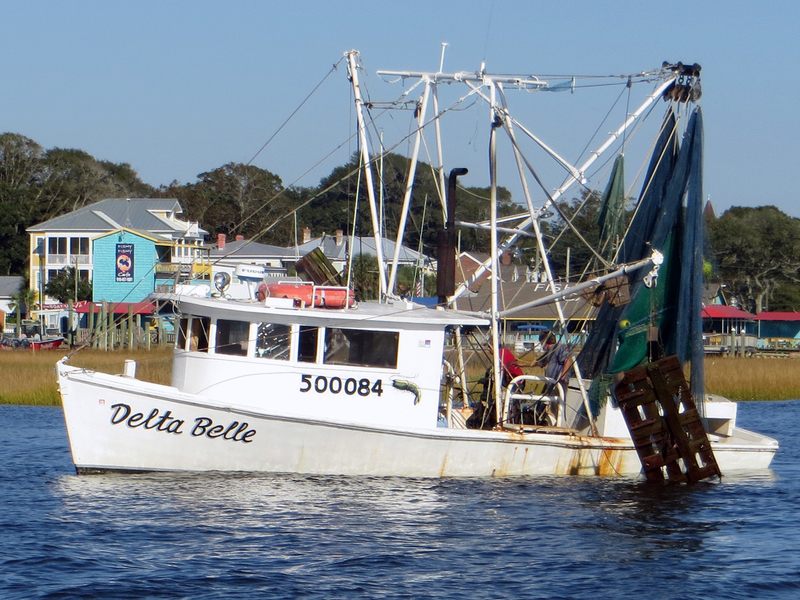 Tidal currents are fierce in Inlet Creek under normal circumstances. At this time, tides are running five feet higher than normal. When the tide turns and the wind becomes opposed to current, water in the creek begins to boil. This produces the dreaded washing machine effect. Factor in wind gusts to 25 knots and soon this tiny anchorage is transformed into a chaotic dancefloor. Some vessels are riding to current, others are riding to wind and still others are rotating 180 degrees around their anchors, riding alternately to wind and shifting current. Anchors drag. Anchors are reset. A handful of boats elect to depart the confusion of the creek, preferring instead to ride out the delay in the more exposed anchorage alongside the ICW channel closer to the bridge. For added insurance, we would have preferred to pay out another 50 feet of chain, but the confines of this pencil-shaped creek prevent us from doing so. Hopefully, wind speeds will moderate tomorrow so that our freedom of movement will be restored. 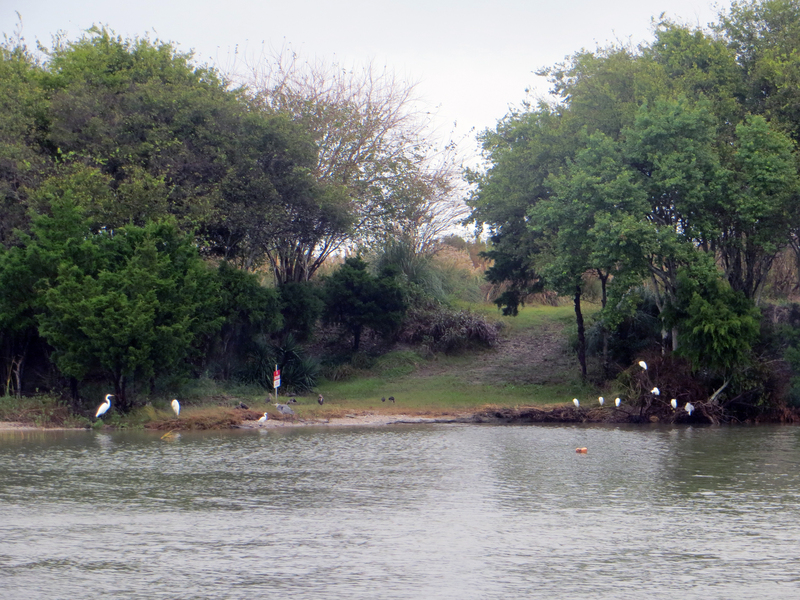 Tuesday morning at Inlet Creek dawns with wind speeds of 10 to 12 knots under cloudy skies and intermittent showers. NOAA’s 9 AM weather report for Charleston reports 8 knots of northeast wind at Fort Moultrie, which is exactly one mile as the crow flies from the Ben Sawyer Bridge. Surely this moderation in wind speed will enable us to be underway shortly. The bridge tender, however, sees the world through a different lens. She states with conviction that winds are currently 30 knots. She admonishes the anxious logjam of waiting vessels that there will be no bridge opening until the wind subsides to 25 knots sustained. Since the issue of wind speed is not a matter of public debate, there is no alternative but to relax, read a book and be ready for the all clear signal. Finally, after a 24-hour delay, the Ben Sawyer Bridge operator announces an opening at 2 PM on Tuesday. A mad scramble ensues, removing the accumulation of sea grass that has accumulated around the anchor chain by the swift current in the creek. By 3 PM, Cutter Loose is docked at the Charleston Maritime Center. After sixteen days and with 630-nautical miles under the keel, we will pause for a week to enjoy the delights of the Holy City.